Ultralight is one the lightest Malt Extract available anywhere and has a great malty, grain flavor. The color is so light because it is made from 100% 2-row base malt. Our manufacturer also uses a minimum amount of heat, and a slower evaporation to reduce the carmelization found in most other extracts. This extract is mashed around 152 degrees which results in beers with great malt flavor yet good fermentability. We use it in a majority of our Recipe Kits. It is unbeatable for light colored Pale Ales and amazing in IPA's where it lets the hops become the focus. If you are making a darker beer you can simply steep darker specialty grains to obtain the flavor and color you are looking for. 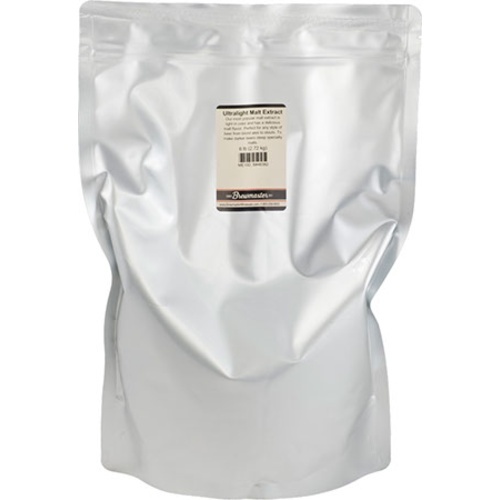 Packaged in a special metallic, oxygen barrier bag that unlike plastic jugs does not allow any oxidation to occur. Does fresh extract make a difference? Decide for yourself! My Dog ate the one from my Kit. Use ultralight malt and add my own flavors. To make 10 gallons of SHE above. Good clean malt for IPAs. Love this product. Comes packaged in no-mess one pound increments. I have avoided all DME since discovering the quality of this product. Looking for a ten pound option which my recipe calls for. Can you do this? BEST ANSWER: Hi George - Unfortunately, we do not offer a ten pound option. We do offer two 5 pounders though. Sure. I use ultralight LME as abase for my stouts and IPA's. I have used Ultralight Malt Extract in extract and partial mash brews with good success. It is consistently fresh and professionally packaged. I'm new to brewing -- in my first three batches with a different brand of LME, the finished product has turned out WAAAY darker than I wanted. This is the first one to give me the color I was looking for. My blonde ale turned out beautiful. I couldn't be happier. Great to hear! We try to offer the freshest ingredients. When LME goes out of date the color it lends will darken. Love this ultra light malt. Gives a nice golden color, light taste of malt, not over powering and allows for the hops to really shine. I use it all the time in ales. Simple, consistent, well priced. I've used this extract with excellent results. A quality product at a good price. Do not make the mistake of leaving this LME in the refrigerator until it is ready to go into the kettle. Ask me how I know. This stuff is very thick and sticky. Frankly, it can be a mess to work with. However, the flavor is excellent and the resulting beer tends to be as well. The light/oxygen barrier packaging shows MB's dedication to quality. Best LME I've used, great price to boot! Will continue to use with most beer recipes. The ease of use of this LME is unsurpassed. It is a superior base to many beer styles. The possibilities are limitless. In a lot of ways I wish I could go back to LME. This has great flavor. It saves at least an hour on brewing day over all-grain. It is always fresh and delicious from MoreBeer. I've made quite a few batches with morebeer's extract here and have been quite happy with it. It's highly fermentable so if you are having some beers get stuck at 1.020 range with your local stuff, this could help. People mistake my beer for all grain all the time using this extract. Just add more steeping grains to make dark beers with it as well. Can't go wrong for the price either. Best LME you can buy! I warm this on top of my kettle lid first to help make it easier to work with. 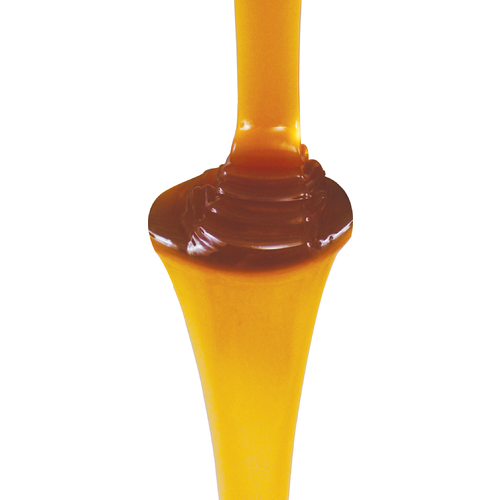 The naturally thick honey consistency could be a big mess if you don't have a handling plan. After I warm it up, I usually pour it into a big bowl and add a few cups of the heating steeping liquid to loosen it further. Then I ladle a couple cups into the bag itself, zip it shut and shake it to rinse it out more thoroughly and then add it to my large bowl as well. I feel this technique assists in incorporating the extract into my hot liquid very quickly without the need to turn off my heat source. I get full incorporation in moments and very little to no chance of scorching.